Anybody who has been following the news is surely aware of the shootings Wednesday at the offices in Paris of French satirical newspaper Charlie Hebdo. Ten staffers of the weekly were killed in the attack and two police officers also lost their lives. The usual suspects are “Islamic terrorists”. My solidarity with the colleagues at Charlie Hebdo is total and I couldn’t be more abhorred by such senseless killings. The attack, however, raises a few important questions, some of which I wish to briefly address in this post. Many commentators, politicians and world leaders have described the incident as a direct and barbaric attack on the freedom of expression and the press. I agree. Journalists should be free to express themselves, no matter whose sensitivities are hurt, without fear of personal repercussions of any kind. And, in fact, every human being should have the same right. However, many societies and countries, including France, have set limits to the freedom of expression. An example is slander. One can be sued in a court of law for peddling false information or information that is deemed to be unjustly injurious to the reputation of a third party. In some European countries, there are equally penalties for expressing certain types of opinion, such as denying the Holocaust or propagating anti-Semitic views. Increasingly, many countries are equally adopting legislation that penalises people who express opinions deemed to be inciting acts of terrorism. There are, therefore, limits to the freedom of expression, at least in the view of those in high places who consider the Charlie Hebdo tragedy as an attack on the freedom of expression. Could the information or opinions propagated by the satirical works of Charlie Hebdo be reasonably considered as going beyond the limits of the freedom of expression? I attempt an answer to this question in the next section. Did Charlie Hebdo cross the boundary? Before addressing this question, let me just put one issue out of the way. Even if the publication did cross perceived boundaries to the freedom of expression, the attacks would still have been unjustified. First of all, the perpetrators of the attack are not judges or a court of law. If they felt offended by any of the cartoons or opinions expressed by Charlie Hebdo, they had ample opportunity to have recourse to the law. And even if they were judges, the death penalty for a perceived offense of expressing the wrong opinion would have been way disproportionate to the infringement. In any case, the death penalty, in my view, is barbarity that screams to the high heavens. Some might argue that even if the attackers had gone to court, the anti-Islam, anti-immigrant-Muslim sentiments that pervade the French elite class, and French society in general, would have scuttled a fair hearing and, in any case, these same sentiments have prevented the adoption of laws that protect the Muslim minority in France (7.7 per cent of the population) from affronts on their religion in the same way that laws protect another minority – Jews. Some Muslim groups in France in fact dragged Charlie Hebdo to court in 2007 for its depiction of Prophet Mohamed, but the court threw out the case. But even if it were the case that French society does not treat Muslims fairly and equally, there are many non-violent instruments to fight discrimination, as Martin Luther King Jr. and Mohandas K. Ghandi, as well as many others, have efficaciously demonstrated. And the alleged discrimination against Muslims in France is generally non-violent and would be nothing close to what was faced by African Americans in Martin Luther’s time or the Indians under British colonial rule in Ghandi’s time. Now, let us address the question: did Charlie Hebdo go overboard? We can only attempt an answer to this question if we know the opinions expressed by the publication through its satirical works on Islam. For nearly a decade, Charlie Hebdo has published a series of cartoons that have provoked the ire of Muslims, especially those that have been perceived as mocking the Prophet Mohamed. In one of the cartoons, Mohamed was depicted naked. In another, the prophet was portrayed as a terrorist, wearing a bomb on his head. In one of its publications, the paper temporarily changed its name from Charlie Hebdo to Charia Hebdo, a thinly-veiled reference to Sharia law that many Muslims hold sacred. 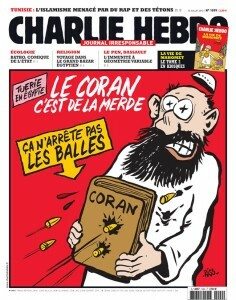 On the cover, Mohamed was depicted as saying, “100 lashes if you are not dying of laughter”. In 2012, as a fraction of the Muslim world burned with riots (which eventually led to the killing of the American ambassador in Benghazi, Libya), following the release of an anti-Islam film in the U.S., Charlie Hebdo decided to publish a cartoon mocking the Prophet Mohamed. This time, the French government intervened. They called the publication and pleaded with the editors to withhold the cartoon. The editors went ahead and published it. The White House press secretary at the time, Jay Carney, criticized Charlie Hebdo for poor judgment, even while affirming their right to freedom of expression. From the preceding paragraph, it is clear that Charlie Hebdo has published cartoons that have been perceived by many Muslims and the governments of at least two Western countries as offensive. Perhaps, as the White House indicated in 2012, the paper might have been more considerate of the sensitivities of Muslims. One may argue that it is not everything that one has the right to say that must be said. But it is also self-evident that if one has a right to free expression, one should not be punished for simply exercising that right. I have a few Muslim acquaintances and they are very passionate about the idea that Prophet Mohamed is out of bounds of criticism or caricature. I have had many arguments with some of them, and I am yet to understand the source of their sensitivities. I have explained to them that Christianity, and its “prophet” Jesus, are mocked every other day, but I don’t see Christians going up in arms as many Muslims do when its concerns Mohamed or their faith. Perhaps it is just that non-Muslims don’t have sufficient understanding of Islam. Perhaps if we look at the international context, with many Muslims feeling like being under attack, we may be more understanding. But even after these considerations, I still believe many Muslims have been overreacting to criticisms of the Prophet Mohamed and Islam. Some may say only a tiny minority carry out terrorist attacks or support terrorism, but the fact is that the sensitivities related to the criticism of the prophet are shared by all the few (and assorted) Muslims I have discussed with since the Charlie Hebdo tragedy. And even though they did not expressly support the attack, they did not appear to regret it. It must be noted that Charlie Hebdo has also published many cartoons mocking other religions. Members of these religions have yet to pick up arms. Wednesday’s attack on Charlie Hebdo of course raises the question of terrorism as a weapon and the all-important question of “Islamic terrorism”. While I very strongly condemn the Charlie Hebdo attack, and acts of terrorism of a similar nature, I hesitate to rush to put all “terrorism” in one basket. The definition of terrorism is often twisted to suit various political and strategic objectives. This is an issue I will handle in a subsequent post.